We had so many mini candy bars in our candy stash (thanks to nana and grammie buying them for my daughter) that I had to just get rid of them once and for all! Here is a cookie recipe that is perfect for using up anything that you have from different candy bars to half empty boxes of raisins or crasins. You really can add anything in but the kitchen sink and they are still delicious! 2 cups chopped candy bars, really any kind will do! In a large mixing bowl, cream butter and sugar together until creamy. Add in eggs one at a time until combined then add in vanilla. In a medium bowl combine oats, baking soda, salt and flour and whisk until combined. Slowly add into the wet ingredients and mix until incorporated. 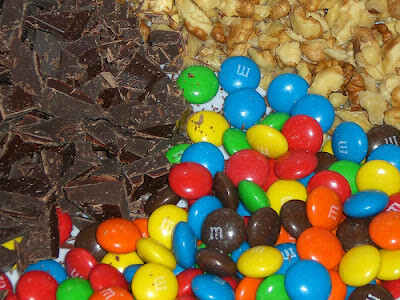 Slowly mix or fold in your chopped candy bars and dried fruit. Drop onto prepared baking sheets and bake for 13 - 15 minutes or until lightly browned around the edges.